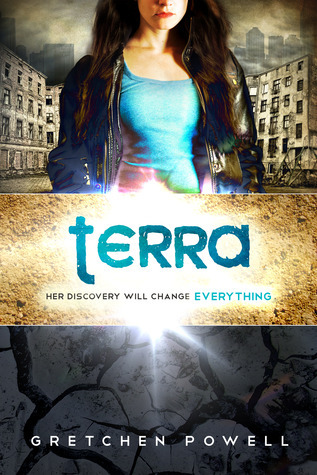 Today I am part of the Terra blog tour. Check out an excerpt, my review and a giveaway! Be sure to check out the rest of the tour stops. The crunch of multiple footsteps sounds in my ears, and I know the unseen speaker is not alone. With achingly slow speed, I bend my knees to pick up my bag and pivot in the direction of the voice. Three huge men stand about a yard in front of me, lined up in a row. All three of them sport shaved heads, making them almost indistinguishable from one another, save for their differing skin tones. Their long brown coats hang open, revealing bare chests covered with tattoos that creep from below their waistlines all the way up to their chins. The man in the middle has a chain of thick golden links hanging around his throat. As I watch it bounce against his dark chest, I realize I’ve never actually seen raiders up close before. All that time spent thinking about Lee’s final moments, what his murderers had looked like. Turns out I had it pictured all wrong. How did I not hear them coming? I always hear them coming. This book was amazing, very futuristic and fun surprises. I didn't take notes this time, I didn't know when to stop to write things down. I think I need to really pay attention to what I'm going to read before picking it up because I didn't know it was going to be like this. It was very entertaining, there aren't many main characters so you feel like you know them right away. I think part of this story is very motivational. When you feel like you don't have anything left, never give up, be strong for what you still have, it doesn't matter how old you are. Even when you feel like everything around is going wrong and there's no one you can really count on for support. I really liked that part of the story, I think girls can connect with her. This is not the first time I've read of a female character but it was nice seeing another heroine, fighting for life even when men try to make you feel like you don't belong. The main character is very realistic, she has doubts, what could she do by herself? Many heroines just go and try to save the world without thinking too much about it. I think there are many people, myself included, that would hesitate when it comes to a very important decision. It doesn't just include you, it involves everyone you know and care about. It's not an easy task and you'd doubt if you'd be able to save everyone, this is normal, we're not superheros. This is book one in the series Terrestrials and you understand what's happening by the end but you don't know what will happen to the world. This definitely makes me want to read the next book, wondering what other surprises we'll uncover and if she'll be able to save them on her own. Thanks for sharing the excerpt. This does sounds like it will be good. Great review. Thanks for stopping by, it's really good. You should check it out. I really like the cover and how this one sounds! I'll have to check it out! Glad to hear that it was realistic and that she actually thought abotu what she was doing. Well, sounds like it was an unexpected pleasure to read. :) Thank you for the new book. Thanks for visiting my blog! I'm happy to see you hosting this giveaway, as I'd already had Terra in my TBR list. So jealous you've read this! I've been wanting to read it but haven't had time to go pick it up. I'm glad you reviewed it. I'll definitely have to go get it now!